Arsenal Vs Chelsea – Driving Around the Bus…..
New Author 14th January 2018 Arsenal, arsene, Exclusive, premiership, preview, wengerTagged battle, chelsea, emirates, grudge, hoodoo, jose, mourinho, title2 Comments on Arsenal Vs Chelsea – Driving Around the Bus…..
No matter how much Sky Sports valiantly attempt to paint this fixture as a title decider and every glory hangs on the result – reality is that Chelsea will hold the Premier League trophy aloft at the last game of the season regardless of whether Arsenal win or not. It doesn’t mean we can’t land a telling blow that leaves a tasty scar for next season. Ah, ‘Next Season’. Arsenal fans are well versed with this phrase. Next season is when the team will challenge. Next season is when the debt will be lifted from the shoulders of the club. Next season the spending starts. Well the excuses are over as Arsenal have challenged, Arsenal have shrunken the debt and Arsenal have spent. Next season though, represents Arsenal’s best chance to become champions. An increasingly settled side, sprinkled liberally with game-changers of variable ilk. You have the cut and thrust of Alexis Sanchez who in his debut season has plundered goals and assists. You have the ninjitsu-like grace and effectiveness of Mesut Ozil who is now starting to dictate games like a patient Director sat in his chair. throw in the explosiveness of Ramsey, the usefulness of Welbeck and the fact Olivier Giroud is now a proven goalscorer of the highest order and you have an attacking lineup that any team would do well to silence. We are painfully aware though, that our attack is not where we falter against Jose’s drilled outfit. The media are finally beginning to realise that Mourinho’s approach to big games – whilst effective – is mind-numbingly boring. Many mentions of Chelsea’s ‘bus’ have been seen in the build-up as journalists as well as fans are all aware of how prospective champions Chelsea will approach the game. Much like I described in a previous blog, three points is the main aim but if the game is strangled to gain the prize, then eventually fans will waiver with their support. It happened at Real and Inter as the faithful audience grew jaded with the same pattern and lack of action. It may reap rewards, but at what cost? On the other side of the coin though, is Arsenal’s naivety in the fixtures of the past. Chelsea hadn’t registered a win against Arsenal since the Premier League’s inception until 2005. Since then, Mourinho has shown that eleven men behind the ball is far more powerful than eight men willing to give up their sense of positioning to gain a goal. Wenger, despite a few occasions in the past where he can claim luck was against his side, has had his nose bloodied, but more importantly, his footballing philosophy has been tarnished in the eyes of the footballing world. It may be great to aspire to goals that have 57 passes prior to a lob over the goalkeeper but it doesn’t pose a threat to an astute rearguard and a packed midfield. Mourinho’s teams have stated that in the big games, they go out, home or away, with the intention of not losing. That leaves the rest of the League to pick off and invariably, that is usually enough to top the Premiership. It doesn’t win any admirers though. The football purists and especially the Real Madrid fans, hierarchy and former players were vocal advocates for a better style of play. His tactics against a far inferior United side stank of a cynical gameplan. 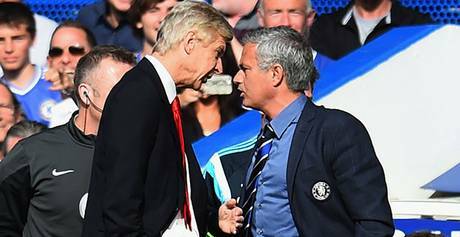 While Mourinho is now starting to take a little heat for his negative approach, Arsene has reassured a fair few who had doubted whether he could still assemble a team that could handle the thin air of the top League places. He has ended the trophy drought and this season, bad start aside, has gazumped all comers with the longest winning run any side has achieved in the league. It would seem that the penny that swivelled on its side so tantalisingly for so long has finally dropped. Manchester United at Old Trafford, ending a run that stretched back to 2006. Liverpool humiliated. Manchester City beaten twice. These outfits represent the chief criticism aimed at the Arsenal manager – when it came to the ‘Big Sides’, Arsenal always came up short. The Manchester City result was the watershed, as a tactical masterclass was the sword which felled the titan from the Etihad. Normally relying on the skills and nous of the soldiers he placed his faith in – this time around the knowledge of the opposition was used as the murder weapon. Since then, the team has grown in confidence. The Chelsea game is the ultimate test. A team that sits rightly at the top of the table. A team that will sit in front of Arsenal, arms crossed expectantly waiting for the onslaught so they can slip their dagger in the exposed ribs of the Gunners. Time and again, this method has brought the goodies back to the Bridge, leaving a frustrated Arsenal team and an angry set of fans. Gooners can await this fixture with a sense of optimism though. Their rapier attacking coupled with their newfound sense of defensive awareness closes off the weakness Chelsea exploit every single time they play. It has become so laughably predictable that an idiot like me can predict how Chelsea will play. Zouma to play as the second holding midfielder alongside Matic. Cesc, the hard-working Willian and Hazard supporting Costa/Remy/Drogba. By playing the impressive Zouma with Matic in the centre, Chelsea will use them as the breakers of play who then use simple distribution to then gift possession to one of the attacking quartet who will in turn look to hurt a stretched Arsenal. Since 2005, this has been the infuriating pattern we have witnessed. When Mourinho left and the manager was either Phil Scolari, Carlo Ancelotti or Avram Grant, the handbrake and shackles were lifted and the team were allowed to play with a little freedom. They were all beaten by Arsenal sides who are far weaker than the one we possess currently. Our winning run, a passage to another final, a settled side capable of anything, an injury count that has relented, a more sensible approach to the bigger games. All pointers toward a sunnier outcome than in the past. 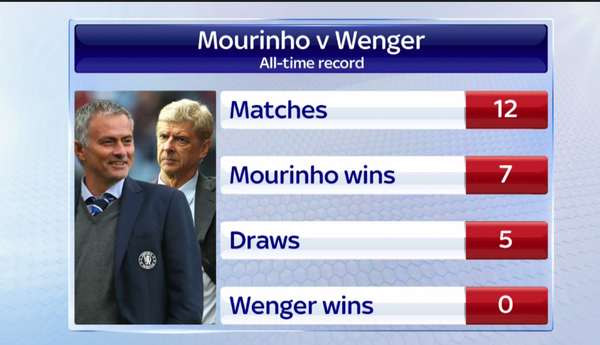 12 opportunities Wenger has had to beat a Jose-led team. Sunday will be his best chance so far to put another rumoured curse to bed. The match is being viewed as a match between good and evil, due to the differing approach from both teams. One looks to appease the purists and adopt a footballing philosophy that is attuned to the great architects of the past. The other is a pragmatist who values results above all else. As Gooners, would we be happy to sacrifice our style of play, our swashbuckling nature, in favour of silverware? Initially, yes. For a season maybe. We would soon tire of it though and no doubt we would let it be known to the men in the boxes that it isn’t acceptable. It isn’t the ‘Arsenal Way’, no matter if George Graham may disagree. Chelsea have the more recent success, but cannot claim to have ownership of any scruples whatsoever. They’ve sold their soul to the rouble. So much so, that an ever-growing group of fans have made it known they preferred their Chelsea when they were terrible and potless. None of this will matter on Sunday. Two teams will duke it out over 90 minutes. The prize? A prospective headstart for next season. Our best chance to end the smug reign of Mourinho is upon us. The title is beyond us but wiping the grin off his face isn’t beyond us. Time to break another duck. Or he could help Mourinho unpack the bus by scoring first. How i’d love that! That will be key. If we can unlock them, watch the game change!